Robert Herrick. No Loathesomeness in Love. Bernardo Strozzi. 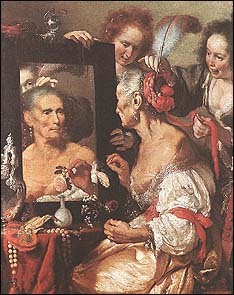 Old Woman at the Mirror. c.1615. London, Lawrence & Bullen, 1891. 11. Created by Anniina Jokinen on January 14, 1998. Last updated on February 9, 2001.